I love making chocolate barks for the holidays. They are quick and easy and everyone loves them. They also make great food gifts. All you have to do is place several different kinds of bark in a festive container or bag, and it will be a food gift anyone is sure to enjoy. 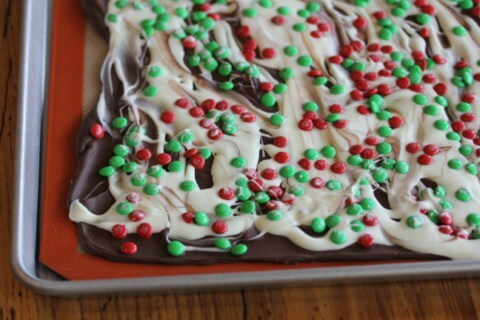 In the past I have made Peppermint Bark and Oreo Cookie Bark and we loved them. This year I tried something new and made Chocolate Candy Bar Bark. 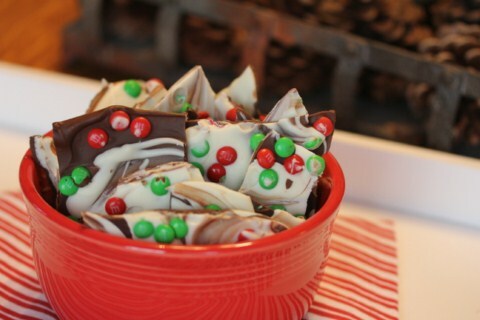 I thought about calling this Chocolate M&M Bark, but then I realized this really would work with any candy. You could use mint M&M’s, Reese’s Pieces, etc. I think the options are endless of what you can do with this, just use the candy that your family enjoys. In a small bowl melt chocolate chips in the microwave at 50% power, stirring every 30 seconds until melted. In another small bowl melt white chocolate in the microwave at 50% power, stirring every 30 seconds until melted. 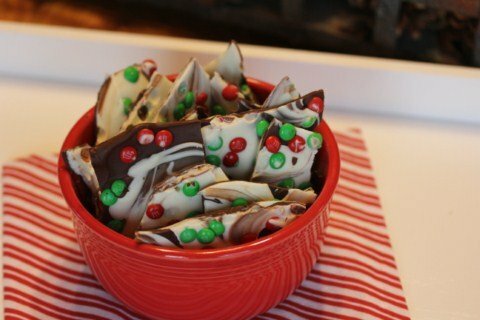 Drop melted chocolate on a cookie sheet or pan that has been lined with parchment paper. I use my silpat mat and it works great. Drop melted white chocolate next to melted chocolate and take a knife or spoon and swirl chocolates together. Sprinkle M&M’s or crushed candy bar on top. Take a spoon and carefully press candy into the chocolate. Place in refrigerator until firm and then break into pieces to serve. Looks wonderful and easy enough for kids to help with. Question…Do you use milk chocolate chips or semi-sweet? I prefer semi sweet, but really any works. Dark chocolate is really good as well. I hope you enjoy it! Mmm, I think I’m going to do half with M&M’s and half with candy canes. I will have to check out your other barks too. I have a silpat. Looks like I can use it for this! Silpats work great for barks and make clean up easy. I hope you enjoy it! So colorful and festive – looks delicious! 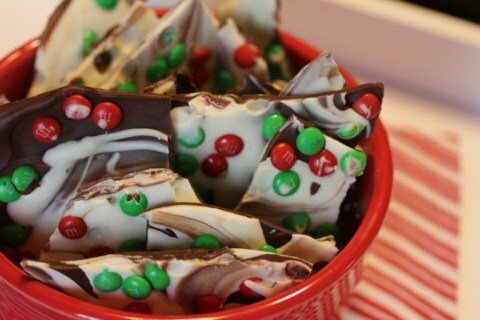 I am getting ready to make this and noticed there is a difference in the peppermint bark recipe and this one. The peppermint bark recipe calls for whipping cream. What does that do (perhaps makes it creamier?) and is it necessary? Yes, it gives the chocolate a little different texture, but you could leave it out and just do a basic melted chocolate and it will work fine. I hope that helps.